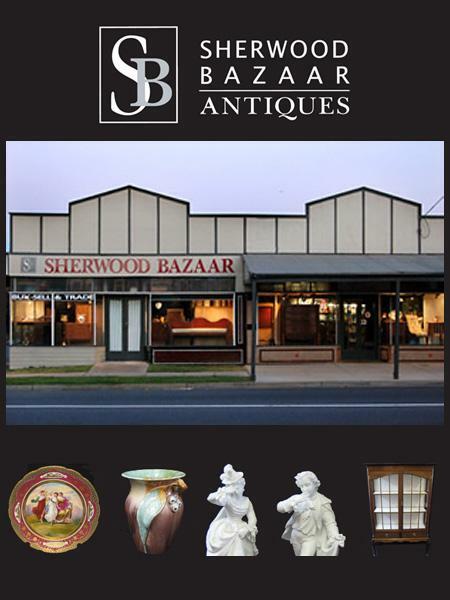 Sherwood Bazaar Antiques was established in 1980 by Paul Thannhauser, in what was once the local corner store & residence that was built in the 1920’s – a local landmark on Oxley Road Sherwood, an old & well established suburb in Brisbane’s west. Paul is the son of well known Brisbane antique dealer Johanna Thannhauser who owned Cordelia Street Antique Centre at South Brisbane for 20 years. Johanna contiues to deal in antiques at Southside Antique Centre in Annerley. Since the 80’s Paul has gradually built his business to what it is today – one of the biggest antique shops in Queensland. The deceptively large floor space unfolds from room to room, housing an extensive range of antiques and collectables. Paul’s first love is Australian antique furniture, pottery & collectables…in fact anything Australian. This mixed with a wide range of English furniture and china, silver, crystal and glassware from all over the world adds up to an eclectic mix of stock. Our philosophy is that antiques have to be useful as well as beautiful and can be incorporated easily into our homes and lives…that means low maintenance and furniture that shows it’s age and years of use, with only the minimum amount of sympathetic restoration as required. Since 1993 Leigh Kenyon has been working with Paul and between them provide extensive knowledge and experience in a relaxed and casual environment. On the whole we personally purchase our stock locally and privately – piece by piece – which means you never quite know what will be in store…what you can be sure of is a wide range of quality items as well as one-off interesting and fun pieces, teamed with friendly service. We are long serving members of the Queensland Antique Dealers Association and exhibit each May at the annual QADA antique fair at the RNA showgrounds in Brisbane. Please feel free to contact us by phone or email at anytime or call in personally to our shop which is open 7 days a week.